The Student Money Management Center and the SHSU Counseling Center will show students how to handle the financial stress of the approaching holiday season on Wednesday (Nov. 10). “Handling Stress and Financial Stressors,” part of the Lunch Skill Series, will be from noon to 1 p.m. in Lowman Student Center Room 315. During the presentation, Drew Miller, Counseling Center director, will help students recognize and combat college financial stress and things such as emotional spending. “Financial stress is a very important topic for everyone, especially during these difficult economic times. One of the leading causes of stress is financial hardship,” said Jacki Brossman-Ashorn, assistant director for the Student Money Management Center. Tickets will be available for purchase online Nov. 9 for the world-renowned Harlem Globetrotters who will be at Sam Houston State University Jan. 31, 2011. The Globetrotters will stop at the Johnson Coliseum during their 2011 “4 Times the Fun” World Tour. The team will take the court at 7 p.m. for a show that promises dazzling feats and entertainment for the whole family. Online tickets, starting at $20, will be open to the public at 10 a.m. and can be purchased at www.harlemglobetrotters.com or ticketweb.com. In addition, early buyers can get an extra discount through Nov. 8 by entering the special offers password GLOBIE during online checkout. “You can get the best tickets before they go on sale to the general public and save 15% on all ticket prices” said Ed Chatal, associate director of the Johnson Coliseum. Beginning Dec. 3, tickets can also be purchased at the SHSU Recreational Sports Center Suite 162 or order by phone at 936.294.3021. What would a child’s drawing look like if it were painted realistically? Students from SHSU were given this challenge in Chuck Drumm’s Illustration class this semester. The resulting artwork will be exhibited beginning Monday (Nov. 8) in the Sam Houston Memorial Museum’s Katy and E. Don Walker, Sr., Education Center Atrium. A public, opening reception for “Monsters,” which will run through Nov. 22, will be on Tuesday (Nov. 9), from 5:30-6:30 p.m.
As part of the class project, a group of first grade students from Stewart and Huntsville elementary schools were instructed to create a unique drawing of a monster, which was used by SHSU students as a basis for a detailed illustration. “By adding texture, shadow, and environments, the children’s drawings became a finished, detailed illustration,” Drumm said. SHSU students took a trip to each elementary school to present their finished illustrations, along with a copy of the original child's drawing, and discuss the changes that took place during the transformation of the original drawing. “As the SHSU students get up and show their art, the first graders go stand with them,” Cox said. “They love seeing how the ‘big’ students made artwork using their monster. For more information, contact Drumm, associate professor of art, at 936.294.1319 or chuckdrumm@shsu.edu. “Red Sky Morning” creates an experience “akin to staring at the clouds, watching the wind sweep across a field of wheat or laying on the ground staring up through a canopy of trees,” according to artist Mark Rumsey. The art installation will be on display in the Gaddis Geeslin Gallery through Dec. 2. “Red Sky Morning” presents an imagined micro view of the cloud structure, crystalline droplets being played upon by light, translated to a macro scale. “The light plays with the natural opacity of the velum from which the droplets are constructed, creating layers upon layers of cast shadows,” Rumsey said. The viewer is required to be active, participating with the space by turning one's head to see a certain angle or lying on the floor to gain a new vantage point to discover the continuously unfolding patterns and rhythms. 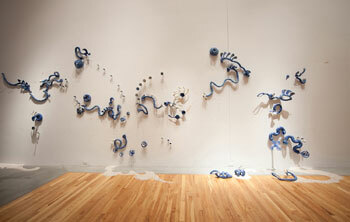 Rumsey is a Michigan-based installation artist who works in prints, paper, cloth, space and light. His work has been featured in the Grand Rapids Magazine, Detroit Free Press and the Chicago Reader, and he has been selected as a feature artist on Artbistro.com and Artistaday.com. A graduate of Grand Valley State University, Rumsey earned a Bachelor of Fine Arts in clay sculpture and philosophy and completed his Master of Fine Arts in printmaking at Kendall College of Art and Design. He has worked extensively to promote the visual arts including integrating the arts into economic and community development efforts, including projects from community-built artworks to organizing contemporary art festivals. For more information, contact Debbie Harper, art department audio visual librarian, at ddavenport@shsu.edu or 936.294.1317. Suk Jin Choi, assistant professor in James Madison University’s School of Art and Art History, will display her mixed-media installation during her “Recollection 3” exhibition Nov. 8 through Dec. 2 in the Student of Fine Arts Gallery. An artist talk will be held on Monday (Nov. 8) from 4-5 p.m. in the Art Auditorium, in Art Building E Room 108, followed by an opening reception from 5-7 p.m. in the SoFA Gallery, in Art Building A.
Choi, who teaches all areas of ceramics, works primarily with mixed-media installation, slip casting, wheel throwing, extruding, handbuilding, Korean traditional Onggis, Korean traditional surface techniques, and drawing. She earned her bachelor’s and master’s degrees in ceramics from Ewha Womans University in Korea and a Master of Fine Arts degree in ceramics from Cranbrook Academy of Art in Michigan. Sam Houston State University faculty pianist Sergio Ruiz will kick off a week of concerts that also will include the School of Music’s Festival of Strings on Wednesday (Nov. 10). The Piano Solo Recital will begin at 7:30 p.m. in the Performing Arts Center Recital Hall. The concert will pay respect to Frederic Chopin’s and Samuel Barber’s birthdays, in 1810 and 1910, respectively, with a program featuring songs by both musicians, as well as Johann Sebastian Bach and Enrique Granados, according to Ruiz. Admission is free, but tickets are necessary. On Thursday (Nov. 11), guest artist from Italy Antonello Farulli will kick off the Festival of Strings with a viola master class at 9:30 a.m. in Music Building Room 217. He will host a second master class on Friday (Nov. 12), at 3:30 p.m. in the PAC Recital Hall. Both are free and open to the public. On Saturday (Nov. 13), School of Music faculty member David Cole and Roselin Pabon from the Conservatory of Puerto Rico will conduct the SHSU Symphony Orchestra at 7:30 p.m. in the PAC Recital Hall. The festival will continue on Sunday (Nov. 14) when internationally renowned cellist Mike Block and jazz violinist Darol Anger will perform in the PAC Recital Hall. On Monday (Nov. 15), Anger and Block will host a master class with students from 12:30-3 p.m. in the PAC Recital Hall. The class is free and open to the public. Finally, on Tuesday (Nov. 16) the Kolonneh String Quartet, with Deborah Dunham and guest artist Farulli, will perform at 7:30 p.m. in the PAC Recital Hall. Tickets to the Festival of Strings concerts are $15 for general admission and $12 for senior citizens and students. Tickets to all performances are available at the PAC Box Office at 936.294.2339 or by e-mail tickets@shsu.edu. Dance graduate student LaNita Joseph will showcase “hip hop, jazz and contemporary dance to tell a traditional story in a non-traditional way” with the debut of her “Urban Nutcracker” on Nov. 13. The premier will begin at 7 p.m. in the Lowman Student Center Ballroom. “Urban Nutcracker” tells the traditional “Nutcracker” story of a girl who dreams of a nutcracker, mice and toys coming to life and traveling the world, through urban, contemporary hip hop and pop music. “It also by features the ‘Sugar Plum Fairy’ as a b-boy break dancer (an acrobatic hip hop dancer), the mice as ‘hood rats’ and they travel to places such as Africa and Brazil, as opposed to China and Spain,” Joseph said. Joseph has worked as a self-supporting artist in Chicago as an independent producer, director, choreographer, dancer and filmmaker for the past five years. Her work has been shown such stages as the Regal Theater, Harold Washington Cultural Center and Chicago Park District, and her choreography has debuted in festivals such as Chicago Dance Festival, Dance Chicago and Rebound Dance festival. She has been an in-resident dance instructor and choreographer, for St. Louis Dance, Chicago Public Schools and now teaches at SHSU. Joseph said she hopes her works will create more opportunities for organized hip hop dance at SHSU. “Urban Nutcracker” is sponsored by the Anita Davis Dance Theater, Joseph’s dance company for which she is the founder and artistic director, and a new student organization called D.O.P.e (Dancers on Point Entertainment). Tickets are $10 for general admission and $5 for SHSU students and are available at www.urbannutcracker.eventbrite.com or by contacting 773.807.3546. Ty Cashion, SHSU history professor, has been named a recipient of the Distinguished Alumni Award at Austin College, his undergraduate alma mater. He was presented the award by Austin College President Marjorie Hass at ceremonies on the college's campus on Oct. 22. Cashion graduated from Austin College in 1979 with a degree in business administration and economics. He later continued his education, earning a master’s degree from the University of Texas at Arlington and a doctorate from Texas Christian University. He began teaching in SHSU’s history department in 1999, currently teaching and researching in the areas of the American west, Texas and social history. Austin College’s Distinguished Alumni Awards recognize those who have distinguished themselves in their profession and in their communities, exemplifying leadership and ethical standards in their interactions.